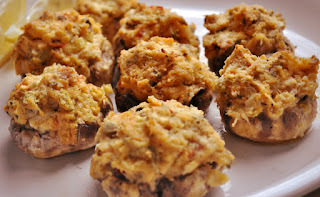 I have had my fair share of stuffed mushrooms and these are some of the best! There is no party food quite like stuffed mushrooms. Even those who aren’t mushroom aficionados are surprised how good they are when they try a stuffed mushroom cap at a party. 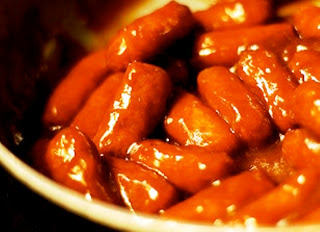 They are always a huge hit at parties and with the Super Bowl being a week from today, they would be just perfect. This is another of Mom’s great recipes. Mushrooms were one of her favorite foods, right up there with strawberries and we were served mushrooms of different versions often. These mushroom caps are stuffed with a heavenly mixture of shrimp and cheese, and then baked until they are a sizzling, golden color. They are easy to make too! Shrimp-stuffed Mushrooms are a great tasty morsel that would be perfect for almost any occasion. OK, maybe not breakfast, but they would fill the bill at brunch, as an appetizer before a formal dinner or a cook-out in your back yard. I bet you won’t be able to eat just one! Wipe mushrooms with paper towel and remove stems. In medium skillet, sauté onion in butter until tender. Remove from heat, stir in shrimp, 3 tablespoons Parmesan, crumbs, 2 tablespoons sherry, parsley and salt. Stuff mushrooms caps with shrimp mixture. Sprinkle with remaining 1 tablespoon sherry, 3 tablespoons Parmesan. Broil 5”–6” from heat source for 5 minutes or until lightly browned. Serve hot, garnished with shrimp and parsley. Just pop ‘em in your mouth and swoon! Yum! You know how to tell a Yankee down South? He’s the one at breakfast staring at the grits on his plate along side the bacon and eggs and trying not to gag. 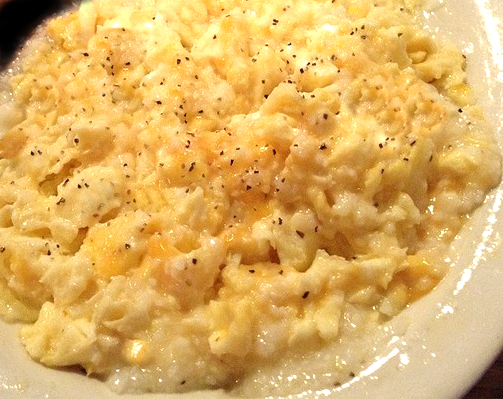 Grits is considered standard fare down South and you get it whether you order it or not. 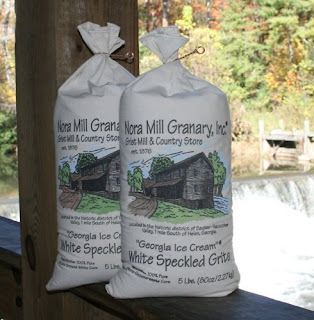 Northerners just don’t “get” grits. It goes together with breakfast like peanut butter goes with jelly or cookies go with milk. I can eat them plain, with just a little butter and salt and pepper; however, there is a little more with this recipe. This is Mom’s recipe for Scrambled Grits. It’s very plain and simple, just another good “comfort food” dish! Place grits in medium bowl, break into pieces with fork. Melt enough bacon drippings to cover bottom of skillet. Spread grits mixture evenly in skillet. Cook until brown on bottom and is consistency of scrambled eggs. It is winter and that means it’s almost time for the main event: The Big Game! It does not make any difference if you’re a die-hard football fan or just want to check out all the pricey commercials, food is the big attraction also. With the Super Bowl parties being just around the corner, it is time to start thinking about some great appetizers to go with the big event. These bourbon smokies are sure to be as big a hit as the game itself. When I take them to a party, they are one of the fastest going appetizers. It is the combination of the brown sugar and bourbon that gives the smokies all the flavor. Actually, you could make meatballs with the sauce and have the same results. The great thing is that they are quick and easy to make. I add just a splash more of bourbon than is in the recipe and at the party; the aroma leads everyone right to the dish. Serve them with colorful toothpicks and let the game begin! Turn down the heat to a simmer and add the Little Smokies. Simmer for 30 minutes or until the smokies look plump and the sauce thickens. Serve in a bowl with colorful toothpicks. How about a satisfying, enticing entrée for your family’s dinner tonight? Cube steaks are a great change of pace and the price is right for families in the present economy with sales of cube steak being up 10%, making it one of the hottest cuts of beef in the country right now. I just really love them and was happy when Mom cooked them as I was growing up; a fast good dinner. 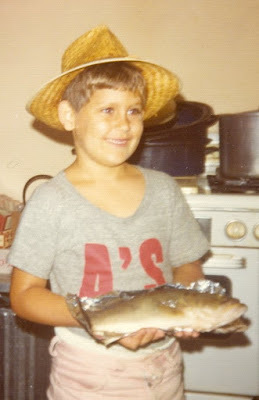 Years later, I sautéed them in a little butter or olive oil, added some salt and pepper and dinner was ready. It is kind of like hamburger that is kicked up a notch. But, the great news is that I have got a delightful amazing ingredient that will put some zing into your cube steak. It will not be just any ordinary cube steak for you and your family! Remember when I told you about the delicious Meijer’s Gold Garlic Parmesan Spread on January 18th? There are close to 100 products in the Meijer Gold line and all of the products have a distinctive story to tell regarding origin, such as the cream pasta sauces that are sourced from legendary Chicago restaurateurs, the Mugnolo family. The products are made with the finest ingredients at affordable prices and you should try them. It’s a wonderful thing! And, who doesn’t love Vidalia onions? Meijer’s has done it perfectly: they’ve combined red ripe tomatoes and select spices with Vidalia onions and came up with another tasty product, Meijer Gold Vidalia Onion Steak Sauce! The exclusive sauce is created by their chef and a renowned, family-owned Texas company to add a tangy flavor to your steak, stews, gravies or sautés. This is the amazingly delicious ingredient in my cube steaks. The Meijer Gold Vidalia Onion Steak Sauce adds a zing to cube steak that will knock your socks off! You will love it! Please give it a try! Place a large skillet over medium heat and add 1 tablespoon olive oil. Place cube steaks in skillet, sprinkle salt and pepper and sear until they have a nice crust on the outside, about 3-4 minutes per side. Add one tablespoon olive oil to skillet. Sauté mushrooms for 4 minutes until they start to turn golden. Place peppers, shallots, garlic and water in skillet, cook until tender and water has evaporated. In a small bowl, combine Dijon mustard, wine and Meijer Gold Vidalia Onion Steak Sauce. Pour into skillet and mix well with other ingredients. Return cube steak to skillet with sauce. Cook down until the liquid reduces by half, a minute or two. Transfer cube steaks to a serving platter. Spoon the sauce over cube steaks and serve. Incredibly delicious and a dish you will love!!! Pam’s note: Not only does the Meijer Gold Vidalia Onion Steak Sauce taste amazing on cube steak, it jazzes up hamburgers to the max! Ummm! Ummm! Disclaimer: This product was provided in a gift basket from Meijer Stores for my utilization. Thanks again to Meijer’s!!! Ummm, love freshly baked muffins and I am always on the quest for a great low-fat, low-sugar muffin. These muffins are some of the best I’ve found. They have less than 1 gram of fat and less than 9 grams of sugar with 20 grams of carbohydrates at 94 calories each. The muffins are even better the next day as the addition of the fruit makes them bake up very moist and light. This is a great way to use up over-ripe bananas. Make them with the combination of fruits that you like, chopped strawberries would work well also. This recipe could be made even healthier by using whole wheat flour and as the fruit makes them quite sweet, you may not want to add as much Splenda. Dispensing with the paper liners and spraying with a no-stick cooking spray would make them not quite as moist and add a crispier edging to them, if that is to your liking. If you want to bake more of these muffins at one time, do not double the recipe; make them in 2 separate batches. For low-fat, low-sugar muffins, they pack a lot of flavor! Spray 12 regular muffin cups with non-stick spray or line with paper liners. In a large bow, mix together flour, baking powder, baking soda, salt, cinnamon and blueberries. In another bowl, beat bananas, Splenda, yogurt, egg and vanilla until just blended. Stir into the dry blueberry mixture until combined. Divide the mixture into muffin tins. Bake for 15-20 minutes until a toothpick inserted in the center comes out clean. They’re fruity good and easy to whip up! Whenever I ask Bill what vegetable he would like for dinner, I really know without asking what the answer will be ~ cauliflower! He loves it and for that matter, I do also. Have you ever tried roasting your cauliflower? I generally steam it but, it makes perfect sense to roast it. First of all, it’s easy. Second, it is nutritionally good and not calorie laden. Third, it is delicious; almost addictive. This recipe is delectable with the rich, nutty flavor of the Parmesan complementing the cauliflower beautifully. Thanks to cooking the cauliflower in a very hot oven, the florets are not at all mushy. But, before putting it in the oven, it is necessary to stir the ingredients thoroughly, covering the cauliflower with the olive oil and seasonings well. By slicing the florets before roasting, it creates more of a flat surface to aid them in caramelizing and turning a golden brown. Simply delicious! Rinse cauliflower, core and slice florets into bite-size pieces. Dry the cauliflower well by patting it with paper towels. In a baking dish or on a cookie sheet, toss cauliflower florets thoroughly with all seasonings, except Parmesan cheese. Spread in a single layer in a baking dish. Bake cauliflower 25-45 minutes, turning every 10 minutes until cauliflower is browned on edges or caramelized and tender. Fork tines should easily pierce the cauliflower. Sprinkle with Parmesan cheese; bake 1-2 minutes more. Toss to mix and serve. Who knew that cauliflower could taste so delectably good! Here is how to please that chocolate lover in your house! 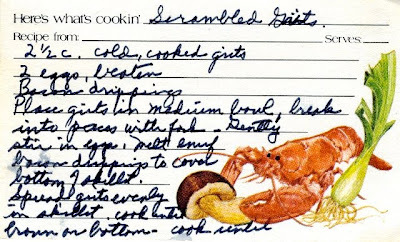 This recipe is from Carolyn, a friend in Louisville who I worked with years ago. 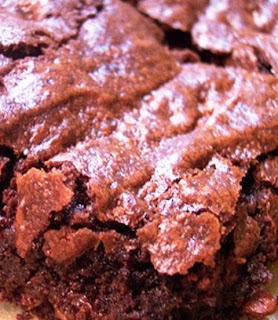 The brownies are unbelievably good! They are thick and decadent; worth every single calorie and after hearing about the recipe you will know why. And to make them even more decadent, she was known to slather fudge frosting over the top! The hardest part about baking brownies is waiting for them to cool before cutting. The smell will be amazing and it will take all of your will power not to slice into them. They will crumble to pieces if cut warm, so you must wait until they are fairly cool to get a nice brownie square. Rich and chocolaty to the max! Spread in 8” x 8” baking pan. Bake in a 325 degree oven for 30-35 minutes. An irresistibly chocolaty treat that will knock your socks off! If you are a big fan of cheese like I am, you will love these cheese straws! Should you have some leftover hard cheese in your refrigerator, this is a great way to put that cheese to good use. I like sharp cheddar or Parmesan myself but, it really does not matter what type of cheese you use; any variety works well. You can make them for a fraction of the price of store-bought, which are usually stale or have broken into pieces by the time you get them home. This is an easy recipe that young and old alike will savor. The buttery dough filled with cheese and red pepper comes together easily with several methods of finishing them. Some cooks pipe the cheese straws from a pastry bag, some use a cookie press with the star or serrated ribbon disc and still others roll the dough out and cut it into strips. Then, just pop them in the oven! They can be stored in an airtight container; actually, they improve in flavor when they are made the day before being served. 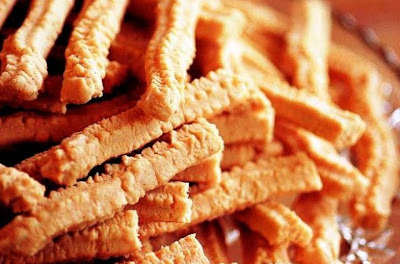 Cheese straws can also be frozen until you’re ready to enjoy them. They are a staple in most southern homes and that is yet another reason why I love the South so much! Cheese straws make a great appetizer and are so scrumptious with soups and salads or as a late night snack, just trot them out anytime you feel like it. And with Super Bowl parties just around the corner, they would be perfect! In a bowl, cream butter well. Add sifted flour, salt and spices. Blend together. Add cheese and combine thoroughly. Place cheese mixture into a cookie press with the serrated ribbon disk or star disk. Press dough onto cookie sheet. Bake at 375 degrees for 10-15 minutes, until lightly browned. Pam’s note: If you wish, instead of a cookie press: Divide dough into 4 portions. Shape each into a ball and roll out in a 7” x 5” rectangle. Cut into 5” x 1/2” strips and bake. There you have the temptation of crispy, salty, buttery, cheesy Cheese Straws! They should have an addiction warning label! Yum! Bubba's all grown up now, but when he has the appetite for a light seafood dinner, he turns to tilapia. It is the perfect fish that you can dress up or down, depending upon your taste buds and the occasion. It can even convert that non-seafood lover you know. Tilapia recipes vary from spicy to mild; remember, he loves spicy and hot as in his chili (see Nov. 21st post) and enchilada (see Jan. 12th post) dishes. This one falls close to the middle. It is a hugely popular fish and due to its mildness, it needs extra help. Bubb is a lover of seafood and fish and he knew just how to help this tilapia out with a wonderful citrus flavor combining orange juice with lemon and a little added tang with the ginger. If you like more of a kick, add a little more ginger and garlic. Tilapia is very adaptable and any number of combinations works with it; base it on what is on your cabinet shelf and in the refrigerator, even adding chopped pecans for a unique twist. It also has the added bonus of being a healthy, good protein, low-calorie fish. And, last but not least, it is absolutely delicious! This is a very easy and delicious creation! Place olive oil and butter in skillet on medium heat. On a plate, dredge tilapia in flour. When the oil & butter have melted, add tilapia to skillet. Cook about three minutes each side until golden. Remove fish, add orange juice and ginger to skillet. Squeeze lemon quarters into skillet. Return the tilapia back to skillet, cook for a couple of minutes on each side. Place on platter and serve. It is a guiltless feast! Have you ever eaten Cuban Picadillo? If you haven’t, you’re in for a treat! Picadillo, also known as Cuban meat sauce, is a thick, stew-like dish of ground beef, tomato sauce, garlic, raisins and capers that is simmered over low heat to combine the flavors. Serve it over rice or even corn bread, with black beans on the side. It isn’t a fancy company dish but, it is great for a week night dinner and it will make your mouth water as it is cooking and fills your house with a fragrant aroma. 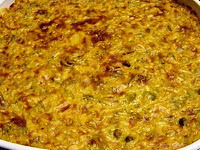 This dish is eaten in many Latin countries but, the Cuban and Puerto Rican versions contain olives. The briny, salty taste of the olives and capers is mellowed out with the sweetness of the raisins. If you like, you could add chopped apples to the mixture also. Cuban-Style Picadillo is not spicy and other than the chopping of vegetables, it can pretty much take care of itself once you start it cooking. It can set until you are ready to eat and in fact, is better if allowed to set for a few minutes. It can be on your table in half an hour! Comfort food all the way! Brown meat, onions and garlic. Add remaining ingredients and cook for about 20 minutes, till mixture is moist but, liquid has evaporated. It should be on the dry side, not saucy, soupy or “ tomatoey” at all. Serve on top of rice, cornbread or black beans along with a salad dressed in vinegar and oil and you’re ready to eat! This creamy casserole will persuade you to eat your vegetables! I love broccoli and rice also, so combining them is the best. 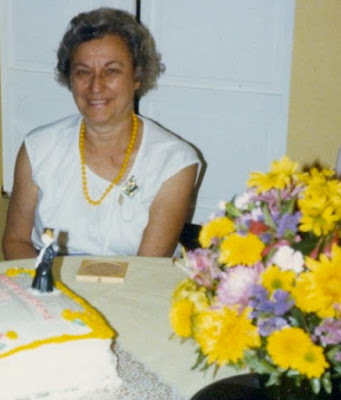 Alice, my mother-in-law loved this recipe and she had a good reason for that, because it is delicious. It is so very easy and tastes great. Broccoli Rice Casserole makes an excellent side dish; however, by adding a couple of sautéed cut-up chicken breasts to it, you’ll have an entrée. Or, adding salmon or tuna would work well also. That would make a full meal! It’s a great winter casserole and that is just what we need right now. By the way, it is just as good leftover! In saucepan, add broccoli, onion and water. Cook al dente, not soft. Do not drain. Add soup, milk and rice. Mix well. Pam’s note: I updated the recipe by replacing the cheese whiz with 1½ cups Tillamook shredded sharp cheddar cheese and adding 1 can of mushrooms, well drained.